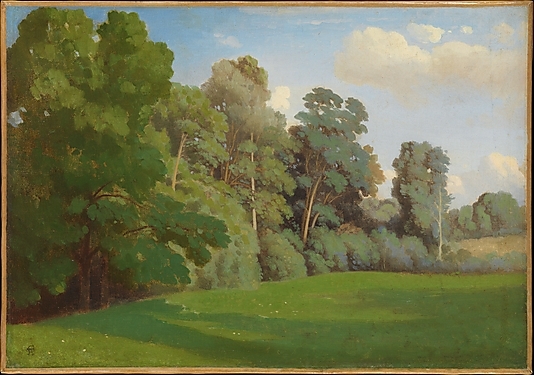 Théodore Caruelle d’Aligny’s Edge of a Wood (1850). Oil on canvas done northeast of Paris. The flattening technique was developed with his hiking companion, Corot. There’s nothing like stepping out into the fresh air to get a little perspective – exactly the view taken by the group of landscape painters featured in the Met’s exhibition, The Path of Nature: French Paintings from the Wheelock Whitney Collection, 1785-1850, on display in the Lehman Wing for a few more days. Most of them feature Italian or French landscapes, and you’ll be surprised to know these tranquil, beautiful visions of nature were considered a little bit radical at the time. Apparently, there once was a time when painters didn’t travel beyond the studio, and certainly did not work outdoors. 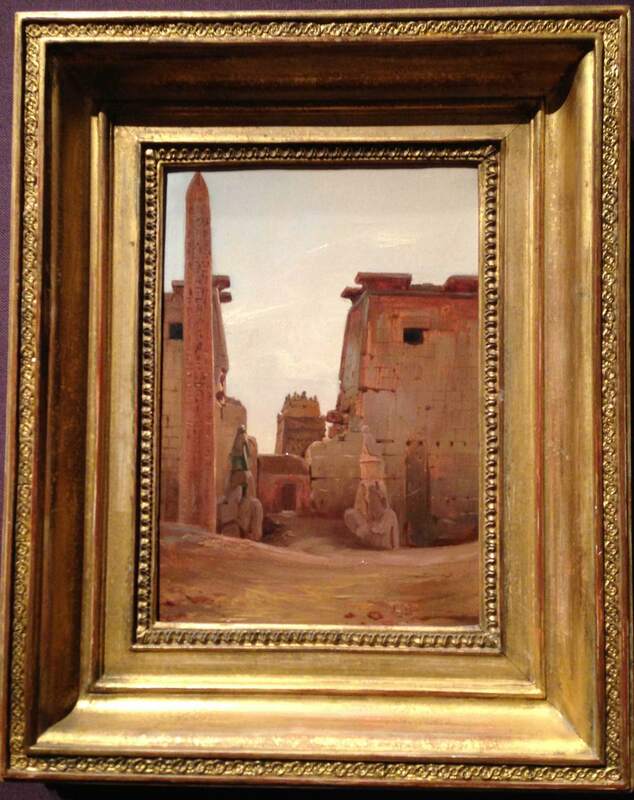 Installation view of The Gate to the Temple of Luxor (1836) by La Bouëre. After Napolean invaded Egypt, the exotic Middle East became all the rage. The missing obelisk ended up in the Place de la Concorde. The artists in this collection (gifted to the Met 10 years ago by Mr. Whitney) literally went on the road, took to the hills, and created spectacularly perfect outdoor oils to record a bit of the exotic, wild, and ruined visions they experienced. And it all happened long before Monet went outside to serialize his haystacks. If you’ve ever wanted to take a Grand Tour of the wonders of Europe and the Middle East, now is your chance. Check out the Met’s online gallery of these works, and enter the mountains, hillsides, parks, ruins, and vistas with new 18th and 19th century friends. If you have some time, you can listen to the Met’s curator, Asher Miller, discuss how adventure travel inspired a generation of painters to break the rules. This entry was posted in Art, History, Museums, Nature and tagged art, history, museums, nature, painting, video by mssusanb. Bookmark the permalink.